The following are two resume examples for a hotel front desk position – one for a candidate who has worked for hotels before, and one for a recent college graduate who does not have experience in the hospitality industry. When writing your resume, take the time to match your resume, and your cover letter, to the qualifications listed in the job posting. The closer your credentials match what the company is seeking, the best your chances for a job interview. This resume begins with a qualifications summary (also called a qualifications profile) which lists the skills, achievements, and experience most relevant for a hotel front desk job. Focusing on these industry-specific keywords at the very beginning of the resume helps to ensure that your resume will be given a serious review by a hiring manager. Download the hotel front desk resume template (compatible with Google Docs and Word Online) or see below for more examples. Charismatic and service-oriented hotel front desk agent with seven years of experience providing world-class service to guests seeks opportunity with an upscale downtown hotel. Excellent command of Microsoft Office Suite and GuestPoint accommodation management platform. Proactive in identifying and fulfilling customers’ needs to ensure comfortable and pleasant guest experiences. THE PARAMOUNT HOTEL, Seattle, Wash.
Greet and check in guests to one of Seattle’s landmark hotels. Describe and deliver tailored concierge services to facilitate patrons’ access to local museums, attractions, and sporting events. Work closely with housekeeping and maintenance personnel to ensure guest room readiness and cleanliness. • Earned several positive customer reviews on both internal survey forms and online review platforms including Yelp and TripAdvisor. • Selected by senior management to coordinate arrangements for multiple conferences attended by up to 500 participants. • Earned “Employee-of-the-year” title in 2017. THE PULLMAN GRILL, Pullman, Wash. Seated guests and assisted with dining room management at popular Pullman restaurant. This resume has a section for relevant experience, which includes both jobs and volunteer positions that require hospitality and communication skills. When you have limited or no experience in a particular job for which you are applying, you should mention in your resume academic, extracurricular, or volunteer experiences that have helped you develop skills similar to those a hotel is seeking in its next front desk associate. 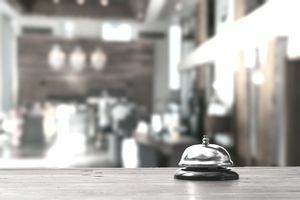 The typical guest services skills that hotels hope to find in a candidate for a front desk job include: customer service, organization, oral communications, written communications, the ability to use and / or quickly learn client relationship management (CRM) or reservation management software, friendliness, foreign language skills (Spanish, Japanese, German), conflict management, decision-making, and professional composure and appearance. Emerging professional positioned to contribute superb communications, administrative, customer service, and organizational talents to excel as Hotel Front Desk Agent. Experience serving customers and dealing with people in a variety of settings. Fluent in written and spoken German. Provide technological assistance for students, staff, and faculty in person and on the phone. Set up projectors and any other technological equipment for professors before class. ABC NONPROFIT FOR KIDS, McLean, Ill. Greeted and registered hundreds of participants in annual 5K race fundraiser, answering any registration questions. Assigned tasks to more than a dozen teen volunteers, overseeing each volunteer’s successful completion of tasks. MOHAWK CREEK CAMP, Rock Island, Ill. Responsible for leading half a dozen 10-year-old children through a series of daily activities. Interacted with parents on a daily basis, providing daily updates on their children’s behavior and achievements. ASHER GROCERY MART, McLean, Ill. Managed cash, check, credit and debit card transactions with 100 percent accuracy and accountability.